We demonstrate via several examples how the backward error viewpoint can be used in the analysis of solutions obtained by perturbation methods. We show that this viewpoint is quite general and offers several important advantages. Perhaps the most important is that backward error analysis can be used to demonstrate the validity of the solution, however obtained and by whichever method. This includes a nontrivial safeguard against slips, blunders, or bugs in the original computation. We also demonstrate its utility in deciding when to truncate an asymptotic series, improving on the well-known rule of thumb indicating truncation just prior to the smallest term. We also give an example of elimination of spurious secular terms even when genuine secularity is present in the equation. 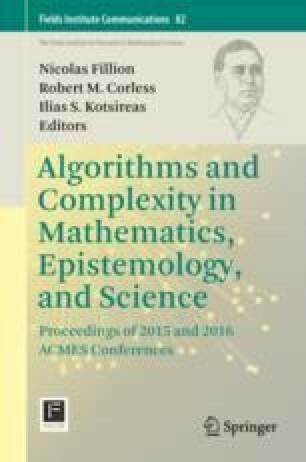 We give short expositions of several well-known perturbation methods together with computer implementations (as scripts that can be modified). We also give a generic backward error based method that is equivalent to iteration (but we believe useful as an organizational viewpoint) for regular perturbation. We would like to thank Pei Yu, Robert H.C. Moir, and Julia Jankowski for their various contributions to this paper. We are also indebted to NSERC, Western University, and Galima Hassan for the key logistic support they provided.